Do you wash your self-made things separately to your RTW stuff? Hand wash them instead? Maybe it’s never even occurred to you to treat them differently? I’m going to admit that I’m one of those people who is slightly-hippie-inclined when it comes to household chemicals. That’s probably putting it lightly, because I refuse point blank to go down the cleaning-product aisle at the supermarket. Instead, I have a cupboard full of bi-carb, vinegar, Neways and Enjo where most people have a delightful array of (for me, head-ache inducing and nasal-passage-burning) chemical products. I also have one of those hypocritical first-world double standards going on because I totally send my more-fancy self-made stuff off for dry cleaning. I have a dry cleaner who knows I sew, so he asks for the fibre content of my fabrics instead of searching for the label. He’s lousy at getting things done within the agreed time frame, but he’s great at everything else. So when I took my wedding dress in to get sorted, he asked me to bring in a swatch of the lace so he could test if his solvents would, you know, dissolve my dress into a blob of bubbling mess. Turns out that lace survived neither of his solvents (!! ), so he refused to clean my dress, and it has since been unceremoniously flopped over a coat hanger behind my bedroom door, awaiting the day I would attend to the patch where I somehow spilt gravy down my skirt during dinner. He even gave me a stack of acid-free paper to store it in. But it’s now been hanging up for over 8 months behind my bedroom door and I’ve been having a mini-guilt trip every time I see it, wondering if my continuous inactivity on the matter would render that gravy stain permanent, if it wasn’t already. So what to do? I hadn’t pre washed the fabrics for my wedding dress, of course. But with some time off between Christmas and New Years, it was definitely time to tackle it. My poor hem facing was ripped off the skirt in several places. My shoes kept catching on it when I went down stairs! Part of a series of gravy splatters. 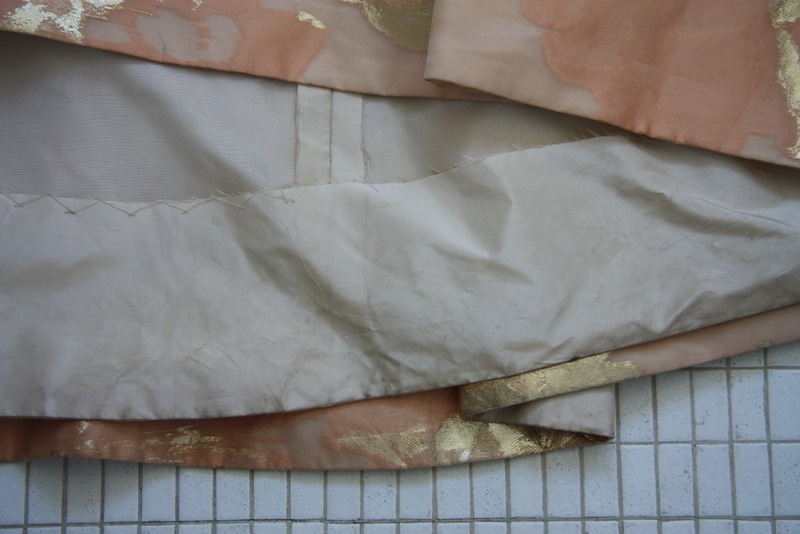 I thought maybe I would draw a grid on some scraps of the taffeta and the organza, wash them and see if they shrunk. But in the end I just washed it and if it shrank, too bad. I still want to get a box of some sort so I can wrap it up in the acid free paper my dry cleaner gave me. So after my dry cleaner turned me away, and seeing as this whole dry cleaner thing was a massive double standard and all anyway, I went in search of products that were toxin free but still effective. The answer came from within my bathroom/laundry cabinet – The Laundress. I bought some of their cashmere wash a few years ago – I’d previously tried washing my cashmere knits normally by hand (this was pre-chemical-freakout days) then getting them dry cleaned – both which left them worse for wear. So the cashmere shampoo was an absolute revelation because it keeps them in great condition. Then two long-ago friends that I used to play violin with in an orchestra during our high school days started up an online shop – The Natural Supply Co. I was browsing soon after they launched, as you do, and discovered that The Laundress don’t only make cashmere shampoo, but a whole bunch of other stuff too, all toxin free. So I bought some silk wash, and have been happily pre-washing all my silks since. This is what I used to clean my wedding dress. 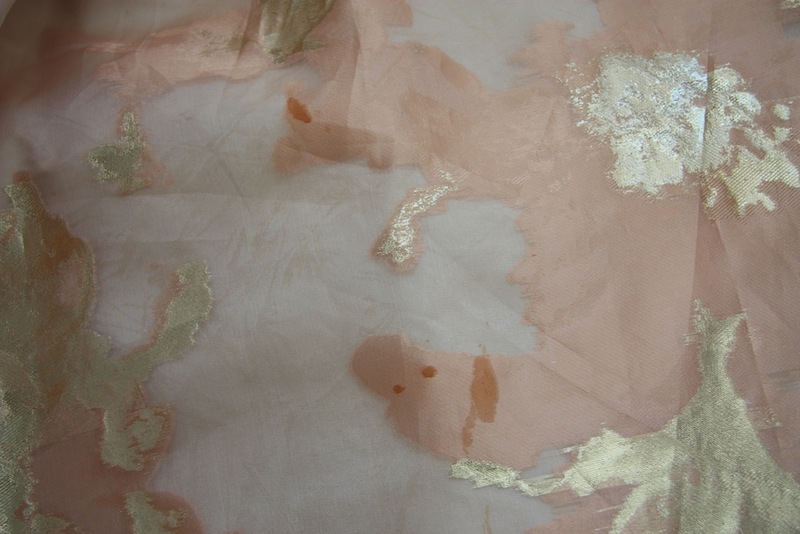 Including, some uber pretty silk which is going to be my next make – a wedding guest dress. Here’s hoping I actually get it done during my Christmas break! Sometimes you just have to give the extra attention to handmade garments and delicates. Interesting post! I dryclean all my special stuff that I doesn’t prewash well – some types of wool and cashmere – and tailored/heavily interfaced things. However, I don’t like the idea of drycleaning too frequently, because of the chemicals, so I try to consider the things I sew in terms of sticking to outerwear for the dryclean only – and I air these clothes after each wear to prolong their wear until the next dryclean. I’ve learnt that most silks, laces, and even lots of wools can all be washed gently (on the delicate machine cycle – yep, I’m a lazy washerwoman here) and come out perfectly. SO I prewash everything I think I can. I just use a gentle/wool wash for all the delicates (softly in Australia). My MIL and Mum use Lux for and elbow grease for their handwashing but I don’t like the overclean-squeaky feel of fabric with plain soap and it’s not washing machine friendly. Yep, I used to have Softly and Lux in my laundry cupboard, too. I probably prefer Lux over Softly, mainly because it has a softer ‘after’ smell, and it seems slightly less harsh on my hands. They’re both been dumped in favour of this laundress stuff now though! When you think about it your delicate nose is a blessing because it has kept you away from those unnecessary chemicals. My precious Lithuanian grandma taught me how to hand wash anything well, as long as its a natural fiber. New fibers with all kinds of synthetics are anyone’s guess. The pool of chemicals that is filthy with everyone else’s dirt at the cleaners pretty much grosses me out!!!! Hurray at your attempt at cleaning you beautiful wedding dress, phew! I’m glad that worked out! So glad you were able to successfully remove the stain! Oh, me too, Tomasa! I actually laughed because it came out so quickly – and to think I’d been putting it off for so long! My big project this year was my daughter’s wedding dress – I need to get it cleaned too! I bought the beading from D’Italia, so I’m planning on asking them for a drycleaner recommendation. The rest is silk from Beautiful Silks, including the organza underlining and crepe lining; and it still cost just over a third of the price of the cheapest Mariana Hardwick. I think you can get the boxes online – try searching for places that sell textile conservation materials. There used to be a woman in Canberra with a private textile conservation practice – she might be able to sell you a box. I handwash almost everything, apart from stuff like sheets, towels, jeans, undies (but not bras), pyjamas, and weekend tshirts. Almost nothing goes to the drycleaner, although I have just dropped off a feather doona and a duckfat-stained embroidered tablecloth. I have a toploader, because I spin the water out of things after I’ve handwashed them. Tailored stuff gets freshened up with my steamer (like the shops have, only cheaper), and very occasionally drycleaned, if washing would affect the interfacing/shoulder pads/etc. Wool skirt fabric is preshrunk; there is either no effect, or it softens and fluffs up nicely. Knitwear gets handwashed then steamed, not ironed – ironing takes ten years of the life of a garment. I like my clothes, and I want them to last. Anne, that’s a gorgeous dress! Great work! The lady Anne is referring to in Canberra is Bernadette at Needlewitch http://www.needlewitch.com.au/about_us_27.html There’s probably someone closer to you though. Oh Anne, it’s a gorgeous dress, and beautiful photography, too! It hadn’t occurred to ask me about a Dry Cleaner recommendation from D’Italia – I’ll ask next time I’m in there. I use Ruggles on high street (about 2 blocks away from D’Italia), he’s not punctual but he does excellent work. Love the idea of a steamer – I’ve heard quite a few people talking about theirs recently so I might investigate that one. Apparently they’re amazing at getting out wrinkles in silk? I’m a massive hand washer too, although we have a front loader so for spinning I put a towel in, the volume makes a difference in how well ‘spun’ out your washing is in a front loader, I’ve found. And thanks for the info about the box – I’ll check it out! I love my steamer – I steam everything that gets worn more than once (like skirts and scarves), or has got crushed in a drawer, or is too delicate to iron, like jersey tops or jumpers. I hardly use my iron, except when sewing or after I’ve washed most woven garments – the steamer leaves them soft-looking, which doesn’t work for things like shirts or skirts with vents or pleats. They need one crisp iron after a wash; if they need a de-wrinkle later, the steamer is fine. The main things to look for are: is it stable (you’ll be hanging the garment you’re steaming on the top of the pole – will it fall over? ); is the water tank a good size; and can you refill the water tank without dismantling it or waiting for it to cool down. It should also be ok with tap water. I am similarly loathe to use harsh chemicals and scents for laundry and household cleaning! I pre-wash and dry my silk fabric, then hand-wash when it’s a garment because I’m afraid our top-loading machine will chew it up. I don’t currently have much wool in my wardrobe – just a coat – and I try to steam-clean it. Basically, I’ll do anything to avoid the chemicals and the cost of a dry-cleaner, although there is a non-toxic cleaner where I live called Blue Sky that I would try if I had to. (Fun fact, they started a wedding gown re-sell store because they had so many people coming in to clean their gowns who didn’t know what to do with them after!) Anyway, thanks for the shampoo recommendation! No, I’m not referring to Bernadette – I can’t remember her name, but she rented a shop in Duffy I think – that was before the bushfire, so I don’t know what happened after that. She did the textile conservation course at ANU. There’s another one in Canberra? No idea who that would be, I thought Bernadette was the only one in the ACT. 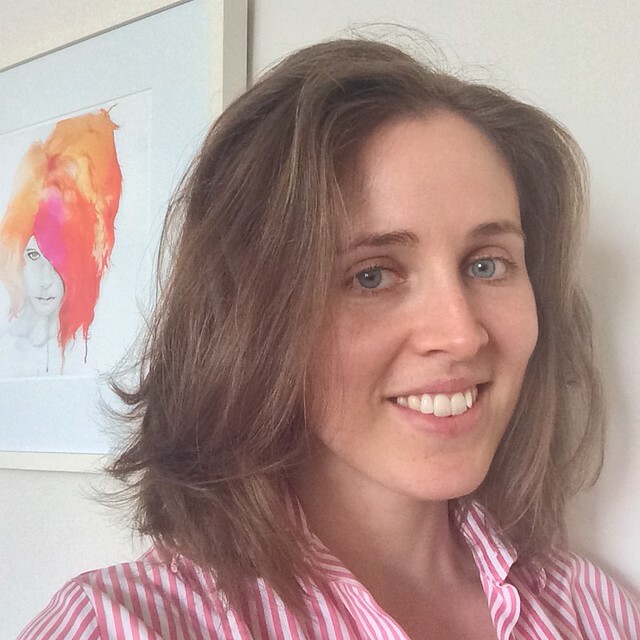 Hi Morgan – a non-toxic dry cleaner? I’m intrigued, and I’d love to know how that works. Quite a few dry cleaners near me do wedding dress resales too… washing mine I felt quite forlorn that I won’t have another occasion to wear it, and wondered briefly if maybe someone else would enjoy it as much as I did. Quite a few people have talked about steam cleaners here – I’m going to have to investigate as I love the idea. Apparently they’re excellent for de-wrinkling most things? The shampoo is excellent stuff, I’d highly recommend it. The silk wash was still quite a bit harsher on my hands, which makes me a little suspicious. But it doesn’t have the burning smell I’ve become very sensitive too, so for now I’ll stick with it until I find something better. It’s a tough question, what to do with a wedding dress! I feel like yours could be worn for another formal event, no? The lovely gold and peach colors make it versatile. I’m not very knowledgeable about chemicals but this is Blue Sky’s info sheet: http://www.blueskycleaners.com/CUSTOMER/toxin-free.php (they use the first two methods only). I prewash everything so I don’t have to stress over dry cleaning. I’ve found that pretty much everything is fine with a gentle hand wash – I often use baby shampoo. I don’t, but I need to after recently shrinking two things I’ve made… Grrr! Glad your gorgeous wedding dress survived – I bet you feel much better now that it’s sorted! Mine is still hanging in my mother’s wardrobe – 5 year’s later. New Year’s pact to sort storage out for them by the end of next year? There’s no rush… the dirt isn’t going anywhere ;) And yep, pre-washing is the best! I have seriously drama queen lungs/liver so am unable to go down the cleaning aisle of the supermarket unless I have my face covered. So it’s a quick dash to me-safe laundry powder and very rarely anything else. So glad your wedding dress came clean easily! Thanks Ista, I am too! I laughed in the end because nothing went wrong and it took all of 10 minutes… and I’d been avoiding it for so long. I took my 1950s lace dress to the drycleaners and he thought the underlining would collapse with the chemicals. So we just steamed it, it wasn’t stained. It was just to freshen it up. Although as fate would have it I forgot to pick it up… and as the CBD flooded after horrendous rain over 4 days I had an anxious night praying that the drycleaner survived… he did! I used Lux soapflakes when I had baby clothes to wash. It was the only thing that didn’t give them rashes. It must be OK! I really want to get a steamer now. I’ve heard so many good things about them! I don’t mind Lux – it’s pretty gently on your hands too which counts for me. So glad your lace dress survived!! When I was buying at the supermarket once, the lady told me her husband had been severely burnt and they were told to bathe him in Lux flakes – so they must be gentle. It’s the dissolving them first that drives me nuts! Really? That seems odd… but yes, the dissolving. Quite often I’ve let the hot water cool in a bucket whilst dissolving the flakes, only to forget about it and rediscover it several days later! In general, I avoid dry-cleaning and chemicals in my bathroom and kitchen. Since I returned to live in Europe, I use Ecover detergent and it suits my needs perfectly! When it comes to me-made garments, I either hand- or machine-wash them, depending on how fragile and delicate they are. Recently, I read about star soap nuts which are supposed to clean your laundry like heaven; so this is something to try next year! Thanks – me too! The star soap nuts are a little fascinating , I love that they are fragrance free and the grey water from them is safe to use on the garden. I’m definitely going to see if I can get them here. I can highly recommend ORVUS shampoo or orvus soap, which is listed as being used by quilters. However, I learned about it many years ago, when I worked on heirloom smocking projects. I had a few published in AS&E magazine and learned that many people recommend Orvus and it is used by museums when they clean delicate pieces. Amazon seem to sell it in huge bottles, but I have found U.K. suppliers selling smaller bottles for around £10.00 and a little really does go a long way. I am pretty sure it was Mary Corbet’s embroidery blog that I originally heard about it from. Silk wash is a great favourite too for silk and cashmere too. I pre wash as much as I possibly can, and both my daughter and I have quite sensitive skin, itching after having clothes dry cleaned isn’t great for us or the clothes!! So thrilled that your Wedding dress is back to new again. Orvus is straight up sodium lauryl sulfate – the main ingredient in many shampoos, detergents, and dish soaps. Most fabrics can be washed very successfully with dish soap or a cheap shampoo. You don’t need to spend much money. 8 months? Try 20 years! I’m into white vinegar & bicarbonate too. A soak in vinegar/water is excellent for de-smelling silk, especially of sweat smells. I find that simply using less detergent is the best way to avoid skin irritations. A front loader really helps with that, we now use a little over a teaspoon for a full 8 kilo load. A really good rinse cycle also helps reduce skin problems. You can make your own cream cleanser (Jif) by mixing dishwashing detergent with bicarbonate until you get the wanted viscosity. 20 years strong! haha. Yep we also use vinegar on our work shirts, it helps get rid of the yellowing on the older, more worn ones :) I’m all for less detergent… my goodness, the number of people I walk past these days and can tell they’re using waaaaaay too much of the stuff. When you smell like the laundry aisle in the supermarket, it’s not a good thing!! Yikes! With the powder I currently use, I was incrementally getting smaller and smaller in the amount I was using (starting from their recommendation) until I found a happy balance. No surprise it’s a lot less than the recommended amount… Thanks for the tip! I totally read your blog post name in the voice of little Britain “computer says no”, lol. It’s a good thing I make a lot of basics and nothing fancy because I’m brutal on my hand made clothes – everything goes in the washing machine on a normal cycle and depending on what it is it gets either hung out to dry or goes in the dryer. I still haven’t washed my wedding dress 14 years later, I had it made locally before I started sewing and now when I look at it all I can see is how badly it was made! The corset had no boning and some terribly applied interfacing that wrinkled through the outer fabric plus it was too big. I’m not even sure where it is anymore! Treasure yours, it’s such a stunning piece of wearable art. Haha yep, that’s exactly what I was thinking when I wrote it! Isn’t it amazing how your perception of what constitutes a good quality garment has changed since we started sewing? Have a wonderful last few days of 2014, Suzy! Nice one taking the risk to wash the dress…glad it paid off. I think mine is hanging in the cupboard…still waiting for a clean (though it no longer fits so meh). So glad the stains came out – phew! It must have been agony tossing whether to do this, but better than dry leaning. Funny that I’m in the same dilemma at the moment, making a dress for DD beautiful silk with a quilted pattern and organza lining, both from Tessuti. I normally wash everything before making but with this fabric I haven’t, as I was afraid it would loose its fullness and I wanted the pleats to be full, if you know what I mean. It probably would not have done that, but it’s so special I couldn’t bring myself to place it in water, even with the silk wash. Anyway, will tackle the cleaning after she has worn it to the wedding. Also, using Susan Khalje’s couture method (a craftsy course I bought a long time ago and finally viewing) and I’m hooked! Fantastic precision and results. Now I love making toiles. Can’t wait to see your new dress. Happy 2015. Yep, hence why I procrastinated for so many months! Silly really, when in the end it only took 10 minutes, but the thought of it potentially being permanent kept me from trying. I would do exactly the same as you are doing – you want the fabric in all its unaltered glory! Cleaning can wait until afterwards ;) And how amazing it that course? Totally changed the way I sew, all for the better. It’s so wonderful being able to see the progression of learning in the quality of output :) Happy 2015 to you too, Evelyne! I love The Laundress products – have used them for several years on my really good things. So glad the silk wash worked for you. They’re pretty fabulous :) I wish I’d stumbled across them sooner! Although some of the suggestions of others I will be looking at trying also. Thanks Karen! So glad this story had a happy ending! Funny the things we procrastinate for ages over… About two years ago we also switched from regular bought detergents to mixing our own. Smells better and is so much cheaper! Double win in my book. I’ve become so much more comfortable with giving my “fine fabrics” a pre-wash, then a gentle wash or hand wash after a few wears. Never had a problem yet! I’m not half surprised, especially as one of my big bug-bears is that the commercial detergents always say you should use so much! Do you have a ‘preferred’ recipe for your detergent? I’ve never had an issue with prewashing fabrics like silk so I can wash them post construction… although it took me a while to drop the mindset that silk was not durable when treated like that – lies! Thanks for the tip! I am usually scared to wash special items and hand wash them with a bit of baby laundry soap! I used to be like that, so I know exactly where you’re coming from. Over the years, I’ve become lax and wash pretty much anything as long as its colour fast! Lovely close-up of your fabric, gravy stains and all ;). It’s such a dreamy color and I’m glad you were able to rescue those spots! I’m ridiculously precious about how I clean my clothes, but I actually like doing laundry so I come up with all sorts of rituals around it. I gave up on the dry cleaners when they pressed some jacket lapels flat after all my hard work. Ugh. And I really dislike scented anything except when it is has lavender or rose water in it. I’m so sensitive to scents of all kinds. I like the Laundress soap and also use Eucalan and Soak for lingerie, wool and silk. (When I run out of one, I go buy the other and go back and forth.) These are “rinse free” laundry soaps that are very gentle. Great for intimates, delicate silk, you name it. I have removed coffee spills, animal stains and all kinds of stuff by rubbling just a gentle amount in the stained area only and then rinsing just that area. Yep, I’m all about the rituals and the dislike of detergent scents too. Why do they have to make them all so pervasive?? I really quite enjoy doing the washing also, I remember quite distinctly the first load of washing I did when I moved out of home, almost as though that was what defined my independence! This is such a great post! I’m totally going to check out that brand! I typically machine wash everything I make on delicate with a mild, mostly toxin-free laundry soap because I just don’t have time or energy to do anything else and I really want to actually wear my silk tops, even if my laundering lowers their life span. I haven’t made anything truly precious, though. Evening dresses are so problematic with the combination of delicate, beautiful fabric and the rigors of the events they are worn at. I work for an organization that puts on an annual gala and I’ve seen so many amazing designer gowns get stepped on, torn, stained, dragged on dirty SF streets, and so on. It’s just inevitable! A once in a lifetime wedding dress really deserves beautiful fabrics, even if they may be damaged a bit in the course of an evening, but I’ve made a firm resolution to only make gowns in cheap, hardy polyesters! It does seem almost cruel that such pretty occasion dresses be subject to such treatment doesn’t it? Although when there’s alcohol and good times involved… it’s easy to forget about it ;) I used to be awfully nervous about silk fabric, thinking it was delicate and not at all durable… but the more I sew with it (and as a direct result… wash it) the more I think we’ve been mislead on that score. Whilst they aren’t all like that… silk crepe de chin is incredibly durable for everyday wash and wear. The more I sew with it, the more I want to sew with it. How lucky that you get to have such events be a regular thing in your life! I’m quite envious :) I love ALL your posts tagged ‘fancy’ hehe! Parachutes used to be made out of silk – the stuff is definitely strong! I am glad your wedding dress is ok and it will keep better clean and in its box without gravy stains! I have learnt the hard way to always pre wash silk for party dresses as silk typically has a10% shrinkage rate. Otherwise you have to dry clean it forever. I have used special silk washes, Martha Gardener’s Wool Mix (or similar) and even clear (non-creamy) shampoo to wash silk. I’ve had some extremely disappointing results with garments being wrecked by dry cleaners and refuse to buy make or wear anything I can’t wash myself. Thanks Valerie – it was a weight off my shoulders I hadn’t even realised I was carrying once that stain came out! Phew. Like you I also learnt the hard way with silk… now I pre-wash everything! I’ll have a look at your Martha Gardener products, I’m always keen to see if there is something better out there. Dry Cleaners have always made me nervous also – The few that I’ve kept I’ve always taken in something I’m not overly attached to as a test drive before giving them things I care about! Thanks for the info about the Laundress soaps! I’ll have to check them out! My regular handmades (cotton buttondowns, knits) get abused in the normal washers and dryers at my corner laundromat, but I baby anything made out of silk or lace or similar. I tend to handwash in the kitchen sink with either dish soap or Eucalan, if it’s really delicate. There’s also an eco-friendly dry cleaner that I use for things like my winter coat. It costs a fortune, so I don’t go very frequently, but it’s nice to have that option if need be. It uses a technology called CO2 cleaning, which works quite well (http://www.greenapplecleaners.com/?co2). Perhaps there’s a similar technology somewhere near you? Oh I hope so, Sonja – because I love the idea of it. If not, then there’s surely a market for it with people being so conscious of their impact these days! You’re the third person to say they use this Eucalan stuff – I haven’t seen it here in Aus (not that that means anything…) so will have to check it out. Ooh, for some reason I thought it was an Australian product (probably because it has eucalyptus in it)! Knitters use it for handmade sweaters, so I’ve always bought it at yarn stores. The nice thing is that it’s designed so you don’t rinse it out, so it’s even less work! Oh, boy. don’t get me started on laundry! Your dress cleaned up beautifully! Super expensive dry cleaning isn’t always a necessity, although it is convenient. And I’d rather launder at home and hang to dry than use my dryer. I regularly wash my cashmere, silks, wool trousers (a pain) and other garments at home. I find the pressing to finish up the laundering process is always the worst. I wish for an commerical pressing setup every time I launder. I’m with you about horrid chemicals and the double standard of dry cleaning. I try to avoid it at all costs (or laziness – there are only so many men’s shirts I am prepared to launder, starch and press before I’ll pay for the service). I love Nellie’s laundry detergents (basically washing soda), and will use all weird and wonderful things from a vintage laundry book (1950’s) to get deodorant stains out of black silk shantung (diluted ammonia) or lamb grease out of wool pants. But I won’t attempt a coat or jacket. Off to the ‘greenest’ dry cleaner in the city for those. I shudder at the thought of trying to press/steam them back into shape! 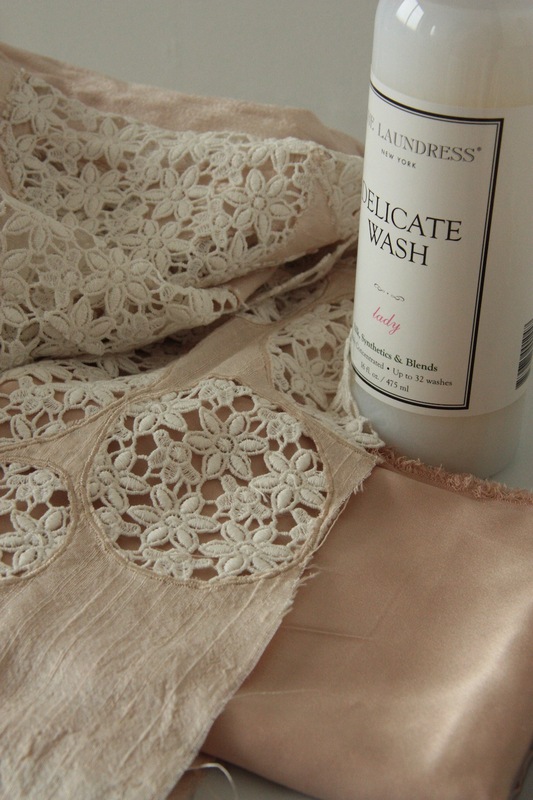 Hand washing your precious dress using nontoxic and eco-friendly cleaning solvents is always the most suitable option. Your DIY cleaning of your wedding dress shows that a dry cleaner is not always the person to fall back on. Cashmere shampoo is a great choice I could know from you. Thanks a lot, Melanie! I agree that Eucalan can work very well. I’m not sure if anyone pointed out the difference between a soap – which can be very simple and homemade -and a detergent, – which contains surfactants and such to make things “bright” – or the different needs of a protein based fabric (silk or wool) versus a plant based (linen, cotton, etc). The best advice I ever got was pretreat fabric as you intend to go on later (wash or not) and treat silk and wool like hair and not like fabric. I use shampoo on silk scarves, saris, chinese brocade, but before the garment is made. Chinese brocade shrinks about 20% and goes from glossy to soft and matte in tone with faint ribbing lines. A mild shampoo without dyes, perfumes, etc can work very well, but spot treat it. Also, leaving any oil-based stain (including body oil) for too long can make is very hard or even impossible to remove. That can then result in having toi use harsher chemicals. My wedding dress was an ivory linen coatdress and it survived everything. In cluding the big shoulder pads. It was the 80’s. You’ve clearly got an extensive knowledge on the topic, Terry – thanks for sharing. I’ve learnt the hard way when it comes to oil based stains – it definitely pays to get on and treat it sooner rather than later. I’ve received the same advice as you when it comes to pre-washing fabric – and haven’t had it let me down yet.